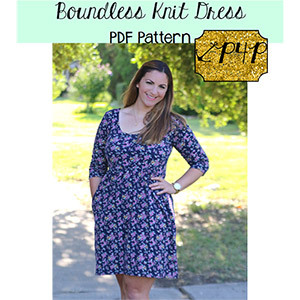 This beginner friendly pattern has boundless options! 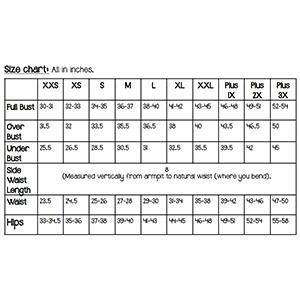 Choose from empire or at the waist bodice to get the most flattering cut for your body. Then choose from sleeveless/tank, short sleeve, 3/4 sleeve, or long sleeve to fit any season. Dress lengths included are mini (great for date night or paired with tights! 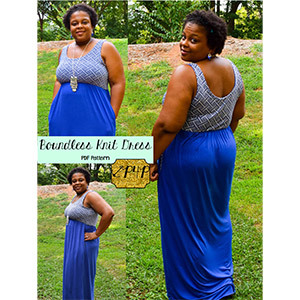 ), at the knee, tea, and maxi to suit every occasion! Bodice can be partially or fully lined (directions include quick and easy method or enclosed seams- so with a solid skirt this can be completely reversible!). You can also add fun, over-sized inseam pockets to have a place for your cell phone, cash, or toys ;). The scoop neckline is a flattering cut without showing cleavage and the scoop back gives you a fun flirty feel with all the comfort of not worrying about wearing a special bra! This pattern is available in sizes XXS through Plus 3x.